Lennie is so sweet. I think that he has a real child-like innocence and I feel horrible for him. He was really improving in remembering what to do and such, but I felt that his control over his strength seemed to be slipping more and more. As his memory grew stronger, his basic control (I suppose... I'm not so sure what to call it) decreased. He just doesn't understand! Lennie is so big and strong. No wonder everyone would want him on the ranch! George... He's like the opposite of Lennie. He's smart and such. He's also a small, tiny person. Not the best person that you'd want as a worker on your ranch. After what happened too Lennie, George just basically gave up on everything! I feel like he just went like, "who cares anymore?! Lennie's gone it doesn't matter. The dream's over." He just slipped. He fell. And he had no one to lean on anymore. It was great to have Lennie and George together, because they had a wonderful relationship. They helped each other in ways no one would think. Lennie leaned on George. So George was like his father/boss/mentor. George could lean on Lennie. Lennie was the reason they got the jobs (because of his strength) and it also stops him from being so lonely. Also, Lennie is just like his rock. He stops him from going around wasting all their money on cathouses and bars and such. 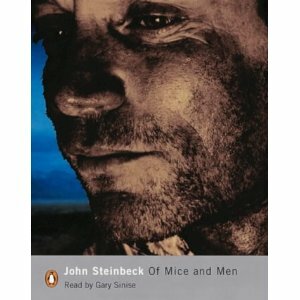 Yes John Steinbeck is a great writer and did a great job on this. However I just didn't enjoy the ending and the story. The characters were brilliant. And he was really true to the time and place and such. Also he used really simple words so it was easy to read. It's just that what happened didn't really please me. :/ That's why I'm giving this book a 2 not a 3. It's still a great story, it's just not my type.